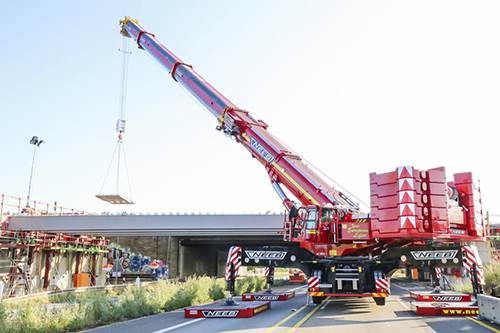 ZWEIBRÜCKEN – January 15, 2019 – The expansion of a bridge crossing over the freeway A1 near Cologne involved unique challenges for crane service provider Neeb from Wuppertal, which is why choosing the crane best suited for the job was enormously important. The team ultimately decided that the Demag® AC 500-8 all terrain crane was the perfect machine for the project. “A somewhat smaller crane could probably have taken care of the job as well. However, we would have had to set it up with its full configuration at the work site, and it’s not like there was a lot of space available to do so. That’s why we decided on the Demag AC 500-8 instead, since we knew that its large lifting capacity would enable it to easily handle all the lifts even with a base configuration. In other words, it was the best choice, technically and economically,” explains General Manager Armin Neeb. The crane was able to get to the site without a problem, accompanied by only four trucks carrying the required counterweight and accessories. In contrast, setting up the crane was a much more complicated affair: “Since there were shaft construction structures and precast components from other construction companies there already, we had very little space to work with. That meant that we had to place the counterweight trucks on the opposite lane and then set up the crane from across the road and the guardrail,” Neeb reports. Despite the extra work and complexity involved, it took three Neeb assembly technicians one and a half hours to successfully configure the Demag AC 500-8 with a 37.9-meter main boom and 120 tonnes of counterweight, so that it would be ready to take care of the upcoming eight main lifts, each one dealing with a 37-meter-long, 51-tonne steel girder for the bridge. However, the real challenge for the Neeb team was still ahead, as the crane had to reach over the guardrail to unload the steel girders – just like the counterweights before – from the dolly-type trailers they had been transported on. The lifts themselves required absolute precision, since the girders had to be set down on the abutments in a perfectly horizontal position. To make things even more difficult, the bridge crosses the freeway at an angle of 80°. In addition, the crane had to be repositioned once between the lifts without getting on the neighboring Leverkusen bridge. Despite all these challenges, however, the Neeb team of seven was able to keep everything under control at all times thanks to their meticulous preparation. The two crane operators were able to complete all the lifts within the planned timeframe of 48 hours on a weekend. “In hindsight, the Demag AC 500-8 was the best choice we could have made. I really think that it would have been nearly impossible to stay on schedule with any other crane,” a pleased Project Manager Dirk Salzer concludes. G.A. Neeb GmbH & Co. KG specializes in transportation, logistics, towing and recovery services and structure lifting projects. The company’s headquarters and management are located in Wuppertal. It partners with companies in Spain, Romania, Russia, the Middle East, Africa, North America, and South America to operate globally, making it one of the biggest multi-national crane services providers for medium and large tonnages. For more information, please visit www.neeb-crane.com.